The Ibiza Spotlight team descended mob-handed on HEART Ibiza to see who would walk away with 2018's prestigious awards. 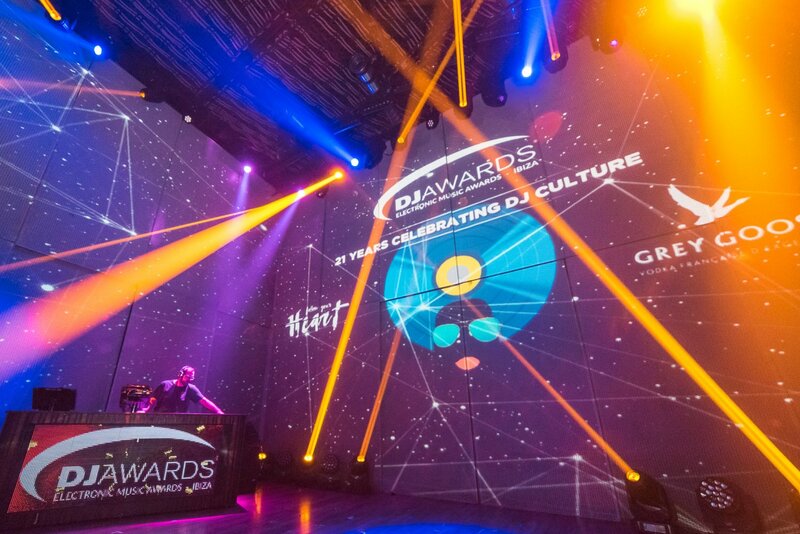 DJs, producers and members of the clubbing world gathered last night at the glamourous HEART Ibiza for the annual DJ Awards ceremony. Dubbed the Oscars of electronic music, it is quite the event in the dance music calendar and saw many a famous face in attendance. With categories paying tribute to the achievements of the artists and organisers, the night was indeed a special one, and the new home of the DJ Awards seemed a match made in dance-heaven. With plenty of special moments, touching words and even a few laughs, the evening most likely goes down as one of the best ones to date. The entire Ibiza Spotlight clubbing team was there to take in all the action. Here's a look at some of the winners and our favourite moments of their Ibiza summer season. Ahh. A track we seemed to have featured a lot in the past few months - and for good reason. It's played everywhere! The Raury & Jaden Smith sampled stomper has been a firm favourite at the island's most popular techno parties in 2018. Proving that the DJ Awards is also an educational experience, we learned that the hook was originally a DJ tool. The catchy vocal proved to get such a great dance floor reaction, that Adam and Bart decided to develop it further in the studio. Adam even went on to say that he “couldn't remember a more successful Drumcode release” - quite the endorsement. So there you go. Given the number of plays and the extent it has sent crowds into a frenzy, this winner is hard to dispute. Few parties captured the imagination of clubbers like Dancing Into Dreamland did this summer. This series of three events immersed attendees into a nostalgic world of childhood fantasy. Naturally, Storytellers collected the award in the most theatrical manner possible. Dressed in some preposterous outfits that could have been lifted right from the pages of a Lewis Carroll novel, they didn't even say a word. Nor did they need to. We wouldn't have it any other way. Esteemed hosts Katie Knight and Graham Sahara were quick to run down winner of the Breakthrough category's accolades. To call this guy "prolific" would be an understatement. With an extensive body of work already on the likes of Hot Creations, Relief, Sola and his own Resonance Records - the sky is the limit for the rising Brit producer. Growing in stature with each passing year - and one of the most down to earth, endearing personalities in dance music - Max Chapman was a deserving winner. He couldn't refrain from being cheeky in his acceptance speech - and that's why we love him. In July when we selected our best electronic live acts to catch on Ibiza, whittling the list of potentials down to five was no easy task. One man we knew had to be included on both merit and enthusiasm was Stephan Bodzin. After last night, it would seem the industry is in agreeance. Sadly, Bodzin was not present to collect his award in person although we were treated to a recorded VT. There's a reason why he has earned the nickname God-zin amongst some. Recently announced as being a part of Afterlife's mega closing party celebrations, he is one you want to make sure you catch on the final opportunity to experience the German maestro on Ibiza in 2018. Following another year as a pivotal component of Together's club room programming, RAM Records supremo Andy C was recognised for his contribution to the genre. He was in good company - with fellow Amnesia Tuesday night residents and regulars forming the entire list of nominees. It underlined the notion that Ibiza is far more diverse than just house and techno. Initially, Deeperfect might be viewed as an outside choice to win best record label. Yet, when you consider just how much its releases get played at techno stronghold Music On, it isn't so hard to understand why. Since 2004, Deeperfect has showcased the groovier sound of underground house and techno. This was just desserts for Stefano Noferini's Italian imprint. We hope that this might result in Stefano himself appearing on more Ibiza line-ups in the future. This one may have surprised a few, but Napoli's Joseph Capriati is 2018 techno master - and we couldn't be happier for him. It's refreshing to see younger talent make the step-up from student to master. Capriati has no doubt made the transition. While he might not have a permanent home on the island at present, there's no question Capriati's star is still on the incline. With several appearances on Wednesdays at DC10 for Paradise plus his birthday party at Destino with Jamie Jones, his popularity is evident. Personally, though, his highlight came in the back-to-back with Adam Beyer at Drumcode's takeover of RESISTANCE in week 4. Two separate awards, but two we have decided to discuss together. Carl Cox was in his typically buoyant mood to collect his trophy - and few could question him being a worthy winner. His ONE NIGHT STAND series sold out three island venues on three exclusive dates. The series was also a forerunner for RESISTANCE where many felt he excelled, delivering his best performances in 2018. Maybe there is just something about the big man, that cavernous Privilege main room and its beefed-up sound system that works so well. Soon after his fleeting appearance on stage, Coxy was jettisoned off to drop the curtain on RESISTANCE's behemoth second season. You don't need to take our word that he stole the show, just watch the stream below for confirmation that King Carl of Ibiza still reigns. This one was hotly contested in the Ibiza Spotlight office - a real two-horse race between Patrick Topping and CamelPhat. In the final furlong, Jamie Jones made a late surge, but Mr Topping stole over the line by a neck. We will be left wondering what if the Solardo boys had been in attendance. Their absence ultimately means Pat will be considered a “paper champ” for many. Pat also picked up the very real award of Best Tech House Artist. Well done, Pat. Congratulations to all the winners and commiserations to those who missed out. The 2018 DJ Awards certainly lived up to expectations, whilst throwing in a few curveballs for an added bit of drama. Of course, the real winners are you, I and the tens of thousands of clubbers who flock to the island each summer. In lots of ways, season 2018 might have been a learning curve for many Ibiza stakeholders. But undoubtedly it's also been an incredibly creative year on the music front. Now the preparations begin for next year. Who will get your vote?